Functional surfaces are designed to optimise their relations to liquids : sticking, repellent, flowing, but locally etc... We investigate the interactions between liquids and surfaces, and how they couple to liquid flow. Suitably modified surfaces can compel drops to always go in the same direction. We explain how these devious surfaces work. 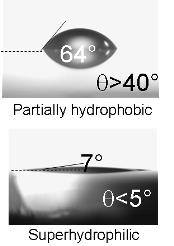 Superhydrophobic surfaces require surface textures to reduce liquid-surface interaction. However, as a side effect, the liquid stays pinned to the textures so that in the end, the interaction is low, but the not the adhesion ! Find out how liquids dewet from periodic textured surfaces. When water flows (fast enough !) through a water repellent tube, it temporarily leaves behind a film, which subsequently destabilizes. Pascaline Hayoun investigates how these films form and disappear, and why it affects the cleanliness of the inside of the tube. A traditional japanese artistic practice is the 墨 流 し (suminagashi) or "floating inks". 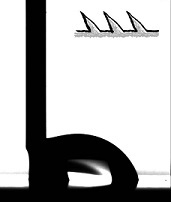 The technique is used for age old style works of art, but also for contemporary creation. Discover how liquids spread on liquids, and the noble art of suminagashi ! Environmental concerns have recently spurred a quest for materials that stay clean, such as TiO2, when subjected to the combined action of sunlight irradiation and exposure to rain. However, the fundamental mechanism that governs the self-cleaning properties of TiO2 still needs to be elucidated.